May Tournament at the Game Preserve! The next monthly tournament will be on Saturday May 28 at The Game Preserve! We will start a 4PM sharp. See the “Game Preserve Tournaments” tab for more info. The Space City Pinball League is dedicated to organizing and promoting tournament pinball events in Houston, TX. 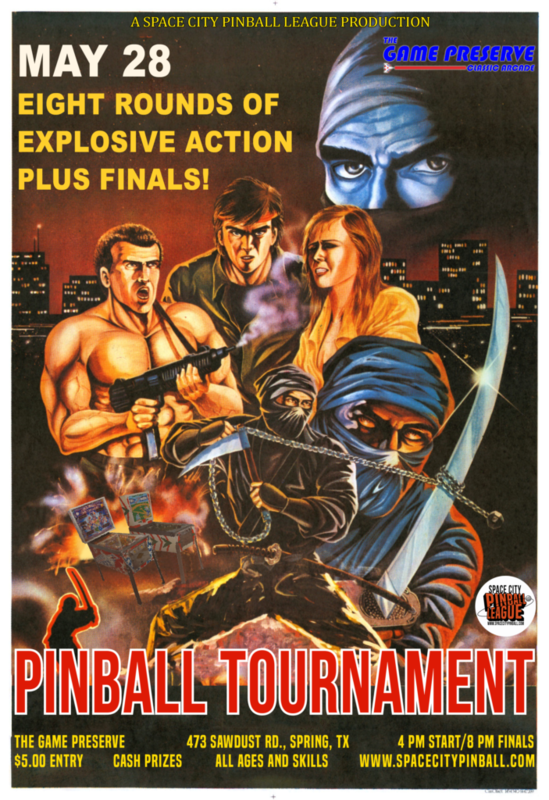 All competitive pinball events in Houston will be posted and documented here. All skill levels are welcome! If you would like to create a tournament, or would like to promote an event, please contact the site administrator! Players are placed in groups of 3-4 and play on a random machine. The bottom two players (bottom player in three player groups) of each game receive a “strike”. Players who receive three strikes are eliminated. Ladies are placed in groups of 3-4 and play on a random machine. We will play 3 rounds of 3 games for a total of 9 qualifying games. Top players will compete in finals. This is an IFPA sanctioned event for women's ranking. Visit https://www.spacecitypinball.com/bellesandchimes/ or https://www.facebook.com/bellesandchimeshouston/ for more information. 8 pm. Elimation Finals for top 16 qualifiers. All skills and ages welcome! Space City Pinball Family at the Texas Pinball Festival 2019!